ShadeMaker Classic or Supreme Self storing bag awnings for all pop up campers are made in the USA. The Classic awning has mill finish aluminium, round tubing for the 2 legs and rafters, with telescoping twist lock legs. The Supreme awning has anodized aluminium, 2 square tubing legs with locking levers and 2 square tube rafters, a patented fabric tensioning device not found on other awnings. Supreme awning now available with XL hardware, select option below. The slot in the track along a camper roof is standard 1/4'' except for 3/8'' on some Coleman & Starcraft model years 1998 thru ?, To use your existing 3/8th track. Slide the awning into your track then drill a few 1/16th'' holes thru the track and into the bead and fasten with screws. DO NOT screw into the roof. Measure your track length to determine the awning size, i.e. 8'6 = 8' awning. Awning products can incur shipping damage, they may be returned in the original packaging for credit or refund for damage or defects only. 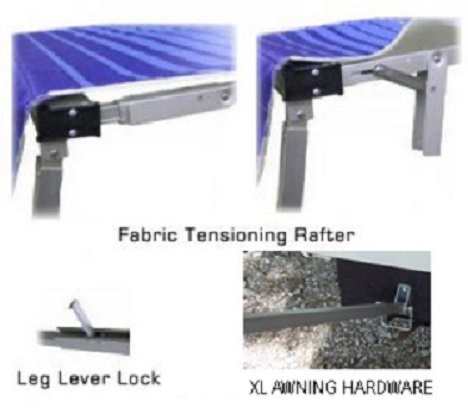 Awning Hardware Pictures Classic - Supreme - Center Rafter NOT for Ordering. If your mounting a Supreme awning on a Coleman that has the track on the curved area of the roof select Coleman Modification option below. Not sure send us a picture of your roof & track area. XL Hardware available ONLY for the Supreme awning. Link to Picture of Supreme awning and XL hardware, legs back to the camper, legs down to the ground is standard. Select XL option below. Free Shipping to the 48 states. Canadian customers email item and address for a shipping quote. The Classic awning leaves the factory in 2 to 3 work days, Shipping is free from Chicago to the lower 48 states.